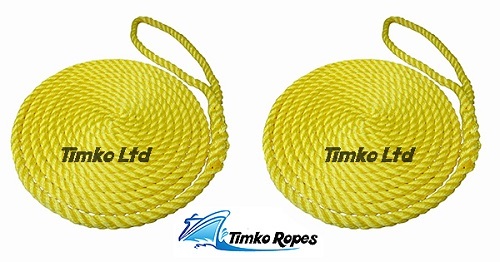 Brand new pair of 12mm x 12 metres long pre-made or pre-spliced polysoft/softline multifilament 3-strand mooring ropes/lines in yellow. Suitable for all kinds of boats, yachts and narrowboats. They have a large soft eye spliced on one end and the other end is heat sealed.